It's time to take a stand against fossil fuels. Fortunately, we know there are plenty of options to move beyond oil, coal and gas. But, we have to start moving NOW in order to stop climate change in time to prevent a dangerous future not just for ourselves, but for our children and grandchildren. This petition asks Members of Parliament and Local Councils to get moving and make a rapid transition away from fossil fuels to a renewable, clean energy future. Put in place an immediate 10-year freeze on all new coal mining in NZ. Expand the current 90% renewable electricity by 2025 target to a target of 100% renewable energy (incl. transport and other uses) by 2050. Create an accompanying action plan, including interim targets every 5 years to make sure we stay on track. Support a solar hot water loan programme to make it more affordable for New Zealanders to install solar hot water systems. Prioritise public transport, pedestrian and cycling solutions instead of continuing to increase the capacity for private vehicles through roading projects. Support research and development for a zero-carbon private transport system. Please sign on to support this petition today by filling out the form in the box on the right. 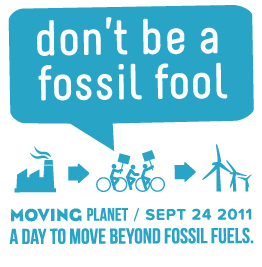 Find out more about local and global actions for MOVING PLANET - a day to move beyond fossil fuels - and how you can get involved here. We've got to get moving - The science is clear, a future run on fossil fuels is no future at all. That's why I'm calling on all MPs and local councils, regardless of their political party - "don't be a fossil fool, get moving now!"